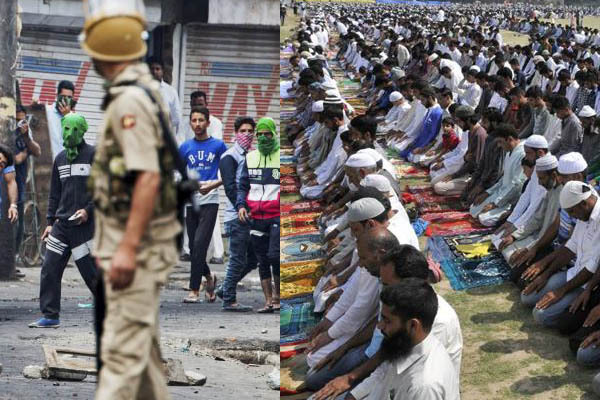 Srinagar (PTI); Eid-ul-Fitr was today celebrated across Kashmir as people thronged mosques, shrines and Eidgahs for special prayers but a few incident of stone-pelting and clashes between protestors and security forces were reported in the Valley. Muslims from all walks of life started making a beeline to Eidgahs (prayer ground) or mosques for offering Eid prayers as a thanksgiving for the month-long fasting of Ramazan. The biggest gathering was witnessed at Hazratbal shrine where more than 50,000 faithful offered prayers, officials said. They said the second largest gathering was held at the Eidgah in the old city in which more than 40,000 people participated. Big gatherings were also reported from Sonawar and Soura Shrines in the heart of the city, they said, adding that similar gatherings were held at all districts headquarters and major towns of the Valley. Barring a few incidents of stone-pelting after the prayers, the situation in the Valley remained peaceful. Clashes between protestors and law enforcing agencies were reported from Sopore, Anantnag, Rajpora, Shopian towns and Safakadal area of the city. There were no reports of anyone getting hurt in these clashes. The authorities have placed top separatist leaders, including Syed Ali Geelani and Mirwaiz Umar Farooq, under house arrest, fearing that their presence at large Eid gatherings could spark violence, the officials said. JKLF chairman Mohammad Yasin Malik has been taken into preventive custody and lodged at Central Jail, Srinagar.